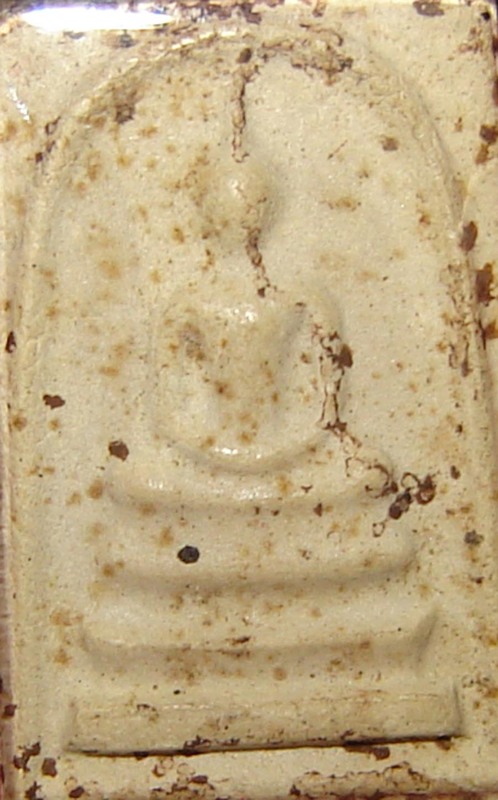 Pra Somdej 1519 BE – Luang Por Plad Kong – Wat Bang Lamung (Chonburi. 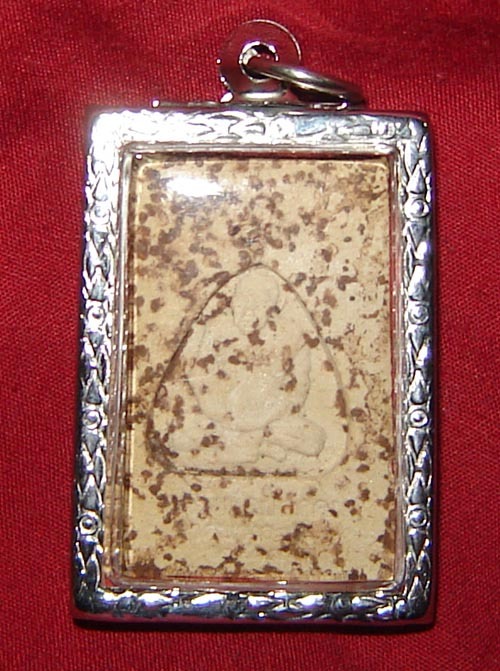 This is a Pim Niyom amulet (preferred and officially accepted collectors item in the Amulet community). Made from Pong Puttakun Sacred Powders. This example is a particularly beautiful amulet with extremely elegant markings and surface texture. This amulet is a very revered item for the people of Bang Lamung, and is an ever rarer to find amulet on the collector scene. It is made from pure Pong Puttakun powders and has primarily Metta, Choke Lap and Kong Grapan/Klaew Klaad powers. Pure Buddhanussati (Remembrance of the Triple Gem), and a focus point of Faith and reminder of ones Dhamma practice in everyday life. 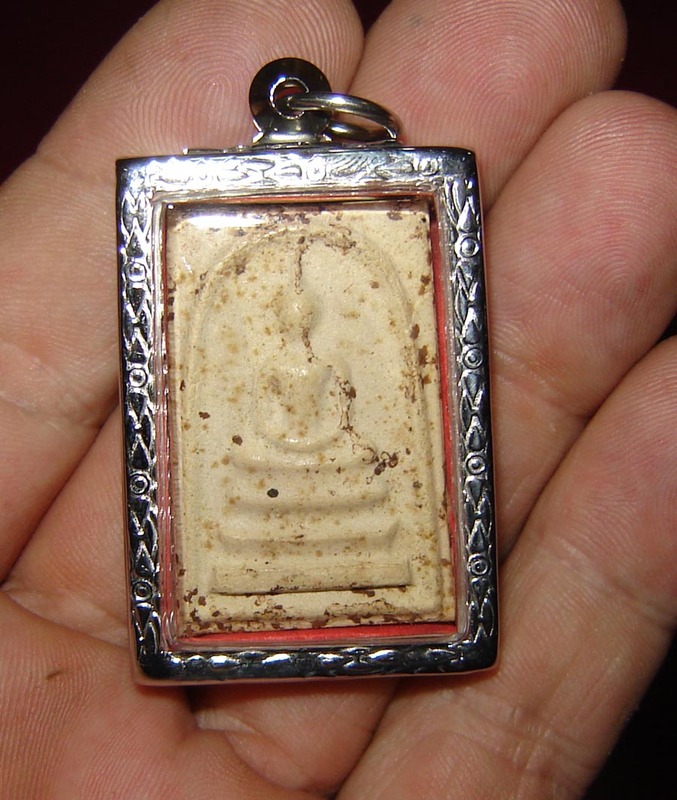 To wear a Pra Somdej amulet blessed by a monk of worthy reverence such as Luang Por Kong, is always an inspiration and moral support in helping oneself to maintain diligence in ones practice as a Buddhist. To know and believe in the purity of the maker of the amulet, and to see the Buddha image on the front, is to remind oneself and have shame before one is about to misbehave or break a precept, and this in itself is a powerful protector to help one resist the Maras, by inducing shame in oneself for the impure thoughts n the presence of an emblem of purity one carries on ones person, namely the Pra Somdej. Shame is a source of suffering, but even the Lord Buddha said that delusions and conditioned thoughts can also be put to positive use until they are no longer needed, or can be escaped from, and so shame in this sense (Moral shame), is a healthy delusion to maintain whilst one still suffers the impurity of harmful or selfish thoughts. To allow a Buddha amulet to assist the mind in shaming itself into refraining from negative actions, thoughts or speech, is to use it for its true purpose. Of course, even if you have never thought of this aspect of pure Buddhist amulet wearing, there remains the mysterious powers of the Thai Amulet, which will protect you and generate your prosperity and happiness. All Thai amulets have magical properties, but those amulets that are pure Buddhist are also a tool for maintaining Morality and Virtue, and Abstaining from Harmful or Negative thoughts speech and actions, as part of the practice of keeping the 5 Buddhist precepts which are integral daily practice of the Buddhist.